The guitar leaning against the wall still plays. Even if you don't know a lick about diatonic scales, the physics of harmonics, or how cochlear hairs work. The shovel leaning on the fence still digs. Even if you don't know how steel is forged, the physics of levers and wedges, or that its handle grew. The old manual typewriter still writes letters when the internet is down. Even if you don't know the history of our alphabet, how the ribbon was made, or why ribbon ink is a technological marvel. Why do we learn anything? I agree with Arne Duncan and his wealthy cronies that education matters, but I care about the parts that matter to my students, to my town. My town is digging, cutting, raking, rewiring, sawing, hammering its way back to normal. If we had school today, most of my lambs would be too shook up to grasp the intricacies of the receptor tyrosine kinases we would be studying. Hard to study when the reality of shelter and food issues poke into a child's life. 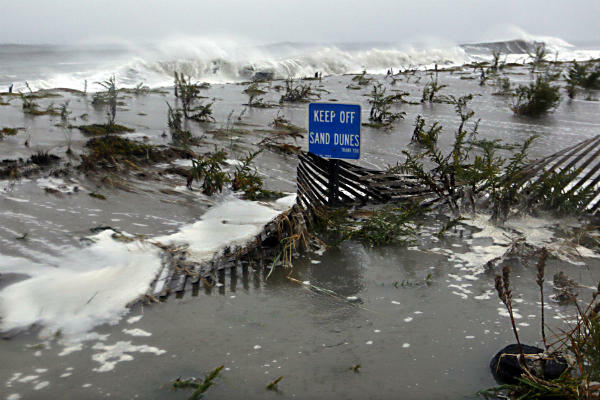 All the education in the world could not stave off Sandy, and very little of what we teach today is of much use in its aftermath. After the storm, my guitar is worth more than Arne's platitudes, but that's not saying a whole lot. We got work to do, right here in New Jersey, with plenty of people who are capable of doing it. We need to rebuild, and we will. The arc of a hammer's swing is a lovely sight, the harmonics of a true strike resonates with the soul. Do we need to teach science? Of course. Does every child need to learn the quadratic equation? No, but Arne would have us teach it anyway. There are only so many hours in a school day, so many hours during childhood. Few of our children truly master quadratic equations, but muddle their way enough to pass state algebra exams with their flexible standards. Fewer master how to fix a damaged home, but there's no fudging those results. Home matters. Families matter. Stories matter. Life matters. It shouldn't take a storm to remind us. For many children, the uncertainties of Sandy mirror the uncertainties they face daily. Really makes you wonder, doesn't it? At what point will we decide that it's important for everyone to know what were once quaintly known as "life skills"? The music made by tools (and guitars) is what lasts, in the end. love the kids, can't stand, can't believe in anything else!